Have you ever wondered just how versatile decorative concrete resurfacing is? From footpaths, roads and schools, to aquatic centres, apartments and fire stations, the strength and quality of concrete resurfacing is second-to-none, and it can be utilised in a variety of settings. 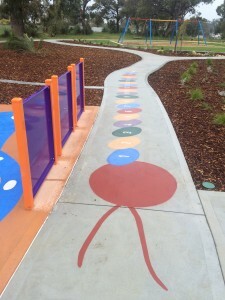 Wespray on Paving has completed a number of successful road infrastructure projects, as well as footpath resurfacing projects across the wider Perth area. Faux paving can be used to resurface roads, roundabouts, median islands and footpath/pedestrian infill’s. Thanks to the versatile nature of this superior product, when applied with the expert skill of our team members, there’s no limitation to the style and colour combinations that can be achieved. Spray on paving is becoming a popular choice for local councils who are beginning to recognise the strength of concrete substrate when it’s combined with cement resurfacing. Wespray on Paving’s quality cement coating can significantly improve the appearance and durability of paved areas in local schools. With projects completed at Little Grove Primary School, Hale School, and Aranmore Catholic Primary, to name a few, spray on paving will provide staff and students with a durable, textured surface that is second-to-none. From school veranda walkways to stairwells and undercover assembly areas, spray on paving can be used in a number of school-based settings. Whether it’s a textured, slip-reducing finish applied to steps, landings and terraces around an outdoor swimming pool, clearly defined paved areas in and around a fire station, or an aesthetically pleasing and functional spray on surface for balconies and walkways in an apartment complex, concrete resurfacing work can be undertaken in a number of commercial settings. What are the Benefits of our Standard and Decorative Resurfacing Services? At Wespray on Paving, our resurfacing products add to the strength and durability of concrete paving, while also creating a stylish finish that will stand the test of time. Our spray on paving also requires less ongoing maintenance, especially when it comes to spraying for weeds and ants, because it has less joints and separations than traditional paving bricks. We also have a UV stable sealer that will protect the paved surface from the sun’s harsh rays, as well as an antifungal additive that will protect the surface from moss and lichens. If that wasn’t already enough, our slip-resistant finishes also increase safety, as people will be less prone to falls when paving is exposed to wet conditions. To learn more about out products and services, contact Wespray on Paving today! Previous PostMake Sure You Compare Apples with ApplesNext PostWhat is Spray on Paving?